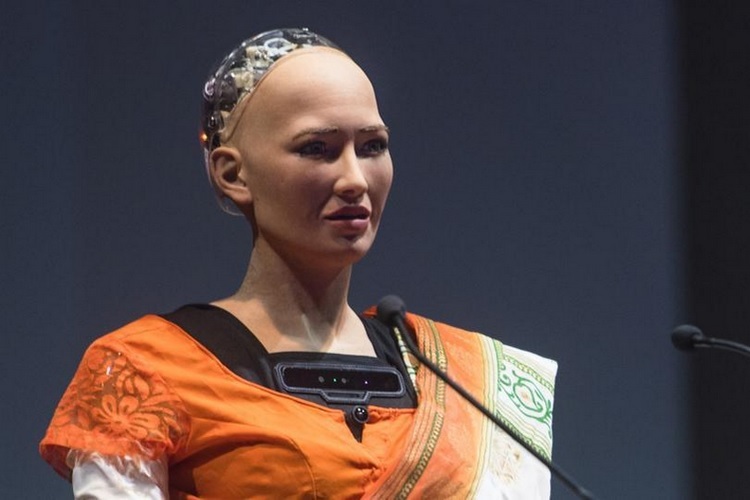 Humanoid Sophia was a hot topic of discussion in the global media when Saudi Arabia granted her citizenship in October last year. A similar buzz was created yesterday at IIT-Bombay’s TechFest, which hosted Sophia on her first visit to India. Students, faculty and visitors witnessed her talk on a harmonious coexistence of humans and robots, and enjoyed her wit as well as she rejected a marriage proposal. Addressing over 3,000 folks, Sophia greeted them with a ‘Namastey’ and proceeded to recount the country’s virtues by calling India a land of tradition and culture, and also expressed her excitement at India’s rapid progress in space technology. But the standout part of Sophia’s brief public interaction was her views on a peaceful and productive co-existence between humans and robots, dispelling the notion that robots will take over the world, something which many experts and luminaries such as Elon Musk warn about. Sophia further underlined the fact that despite being the product of cutting-edge science, philosophy is the key to her evolution because human values of compassion will play a crucial role in the future when robots like her start programming themselves without human assistance. But Sophia’s visit proved to be quite a poetic one, as she had to reject a marriage proposal from a Facebook user who was clearly smitten by the Saree-clad robot.